On September 25, 2014, the Federal Aviation Administration (FAA) granted an exemption to its ban on commercial drone use to six movie and television production companies. Negotiations for a similar exemption with a seventh company, Flying-Cam Inc., are currently pending. The waiver will allow the companies to use for filming use unmanned aerial drones within a restricted area for purposes of filming operations only. The FAA stated that the companies were granted waivers from a series of existing mandates so long as the companies abide by a set of safety standards, including the requirement to immediately report any accidents or otherwise consequential equipment failures, a thorough inspection of each aircraft before each and every flight, a flight range of less than 400 feet from the ground, and aircraft weight restrictions. 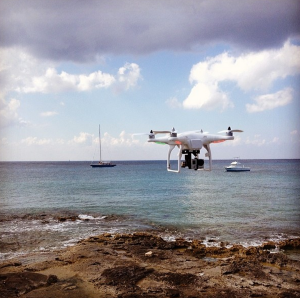 Historically, film production companies have had to shoot overseas to be able to legally capture aerial drone shots. This groundbreaking exemption has inspired another 40 companies, film production and otherwise, to inquire after their own waivers for commercial use. Television and film production companies have been working toward such an exemption for many years as a way to capture shots that fall within the airspace unavailable by helicopter or crane use. The inherently strict control, tight time budget and detail management on a film set of any kind likely contributed to the fact that the film industry beat companies with drone business ideas in other industries, like conservation and aerial surveying, to the punch. Even so, this action by the FAA is said to be a giant step toward approving commercial drone use for a broad scope of other companies who have long sought exception from the all-out ban, such as oil, railroad and agricultural companies, among many other potential ways to make money with drone video. The only exemption the FAA had approved before this one was granted to British Petroleum (BP) to survey a small area of Arctic land in Alaska. The film companies who received approval for commercial drone use are Astraeus Aerial, Aerial MOB LLC, HeliVideo Productions LLC, Pictorvision Inc., RC Pro Productions Consulting LLC and Snaproll Media LLC. The FAA said it will release its official rules for the exemptions no later than the end of this year. Regulations are projected to be finalized within next year. Private investigators wanting to legally use UAVs will likely have to wait a considerable amount of time yet. Drones may be used under special ccisumrtances with a COA from the FAA. Historically, this authorization has required a private pilots license and ground school. It is possible. There are several examples of past COA authorizations on the FAA website that may be leveraged for special applications. « Back in Startup Mode. Time For A New Direction.